We have had our fair share of sugar lately so I thought it was time to cook a big pot of beans to help offset the sugar we’ve been ingesting. 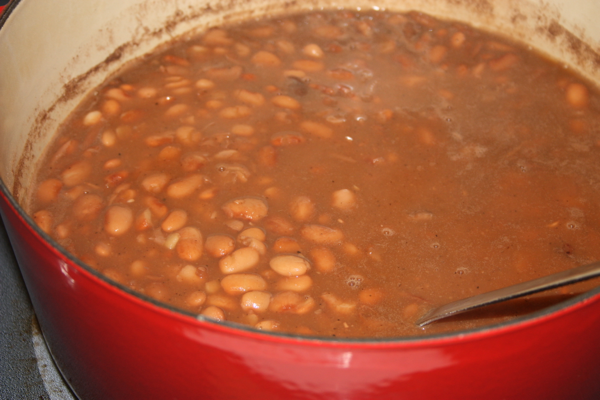 There is something about a simple pot of beans to help bring you back to your roots and provide you with comfort. When live gets hectic and crazy, sitting around eating a nice warm bowl of beans just seems to help settle you down. This “settling down” was just what I needed. On Monday I put a big pot of beans on to simmer. 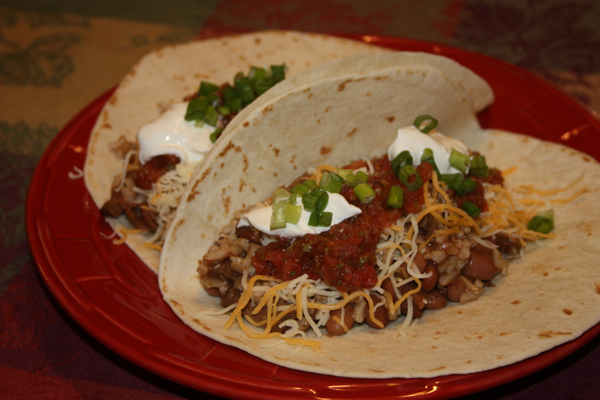 Beans are great to have on hand for super easy suppers so I decided to cook a 2 pound bag of dried beans to insure we could use them in a variety of ways. When I was little and my mom would make a pot of beans, it was not on my list of favorite meals. Today, however I find that I enjoy beans quite a bit more than I did in my childhood. Maybe they just help remind me of home and simpler times. I don’t know. Several weeks ago, I was on the phone with my dad and he asked what I was cooking for dinner. To his surprise I responded with a beans. I guess I have come along way from my childhood and now really do enjoy a nice bowl of beans and slice of cornbread. 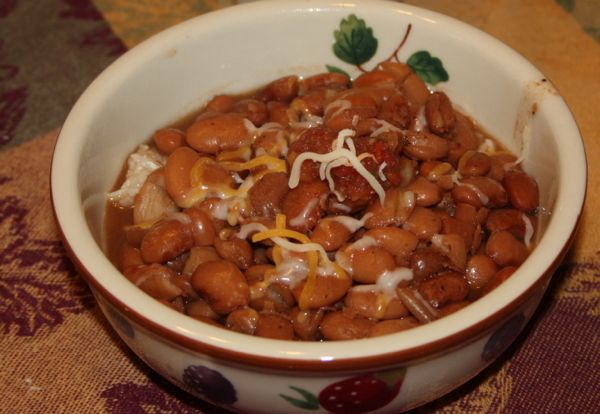 My bowl of beans for supper last night was just what I needed to help warm me up with the chilly outside temperatures. Not only did we have a nice hot meal with the beans, but we also have plenty of leftovers that will allow us to use them in a variety of ways. I can’t wait to share all the different ways I will use my pot of beans this week. It is quite exciting to have so many leftovers that I can turn into a variety of different dishes thanks to by slow simmering beans on Monday. Did I mention how economical beans are? Here is my very basic approach to a pot of beans. I can’t wait to share all the different ways I will use them but you owe it to yourself to start with a nice hot bowl of plain beans. Rinse beans in cool water; pour into a pot, cover with water by 2 to 3 inches. Bring to a boil, then reduce heat and cover. Simmer 2 hours, or until beans are tender. Add water to pot as needed. Beans should have a thick broth. Toward end of cooking time, add salt and pepper and season to taste. Don’t over-salt. Serve in a bowl with cornbread. 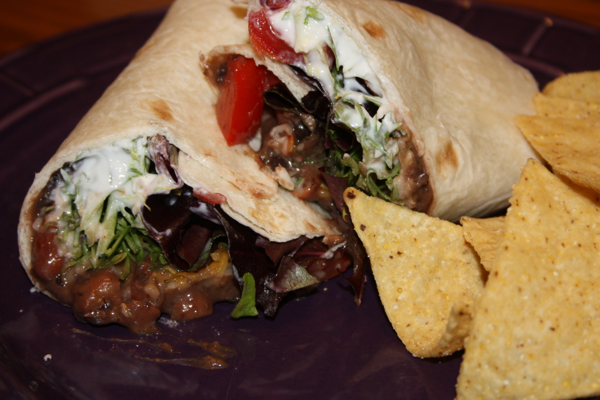 Can serve with small bowls of grated cheese, salsa, chopped onions, chopped fresh jalapenos, sour cream, and/or cilantro. 4 Comments on "Pinto Beans"
My grandson has been asking for me to show him how to cook a few things since he is about to move into his own place. One of the things he asked for was beans & cornbread. I haven’t done that yet, because I usually take the meat & bone from a big spiral sliced ham and make it an all day production. You have inspired me to give it a shot this simpler way. And of course, we will have cornbread baked in my grandmother’s iron skillet! Too bad we can’t get Three Rivers cornmeal anymore, but I still have their recipe (cut from the bag) that I have used for 40 years! Looking forward for ideas for leftover beans because I always go overboard on the amount when I cook beans! Thanks for reminding us all how wonderful beans are and how easy to fix!! !